1970s-era short story about an insecure woman treated by a computerized therapist, computer become neurotic? I'm almost 100% positive this one comes from the mid-late 1970s. The story starts off in a crowded elevator, with the protagonist (a young woman, probably in her early 20's) fretting about various things. She's chiding herself for having garlic bread with her lunch, as she's feeling a bit bloated and is sure the other passengers can smell her garlic breath. She is mortified when she looks down and notices her ugly big toe has pushed through a tear in her pantyhose. That sort of thing. She gets off at the floor where the therapist she is going to meet is. As mentioned before, the therapist is actually a computer programmed to counsel people. A series of Q&A's between the woman and the computer ensue. IIRC, the course of the conversation becomes somewhat comical, and the computer-therapist becomes a bit perplexed at some of the responses. The woman leaves the session feeling great about herself. The things that bothered her previously she now sees in a positive light. Her exposed toe is akin to a blossom pushing up from the earth and showing itself (or something like that). In the elevator down, a handsome man next to her notes she had Italian food for lunch (due to the garlic breath). She flashes him a smile, says "you should try my lasagna", and suggests a dinner date. Meanwhile, in the final paragraph, the computer-therapist is going through a litany of humorous self-queries, all of them indicative of newly-found insecurities. The healer has become the patient, so to speak. The story is Transference, by the late Sharon Webb. 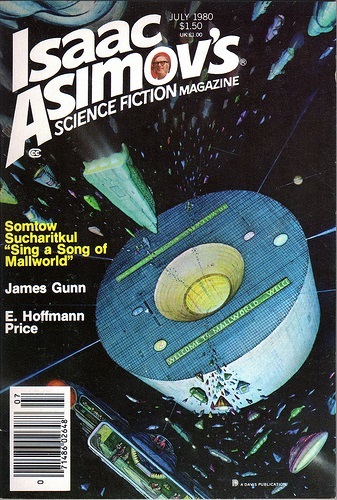 The story appeared in the July, 1980 issue of Isaac Asimov's Science Fiction Magazine. I found my copy of the issue in my attic. I have been unable to find the story online. The protagonist's name is Marilyn Taylor, a nervous 30-something with a therapy appointment with a computerized therapist designed by Allied Meditronics. The details are pretty much as I remembered them. Anyone remember a Golden Era pulp mag short story about a sentient(?) implantable computer named Manche? Story Identification: Were-animals/shifters lead by human alpha/leader? Story Identification: Linguist Ambassador between planets?